The FX-603p is a great find! Also this machine was released in 1990, i've only heard of it's existence just recently (think mid 2005). Although this machine may seem quite banal to most people, it is actually quite unique and unexpected. So what makes it so special? Well, first it's a Casio, and i make it no mystery that i'm particularly fond of Casio. But this is not enough. In the early 80's, Casio released one of it's most popular calculator ever; said to be Casio's first dot-matrix, alphanumeric display programmable calculator : the FX 602p. 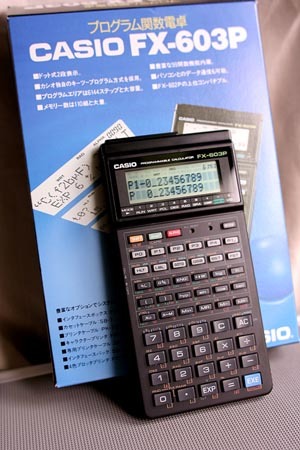 After the FX-602, Casio will abandon it's programming language to focus on a new language, later to be used in the very successful graphical calculators like the FX-7000p. This new language will survive until the 90's, when newer models will introduce a more Basic-like language. In the meantime, the 602p was still sold by Casio, and discontinued in 1989. The year after, Casio decided to release the 603p; which was a "simple" improvement of the almot 10 year older parent model. The 603p thus uses the same programming languages as the 602p, but offer many technical improvements closer to 1990's standards : a different casing, more memory and a 2 lines display. The 603p was never released in France and, as i've said, i've discovered it just recently. It's fun to see that it still sells for a significant price in japanese auctions, meaning i'm not only one interested in the FX-60X lineage!